The original church of St.Peter’s Parkstone was built in 1833. 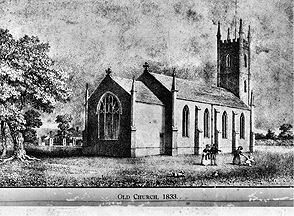 By the 1870s it was decided that a bigger church was needed and so the current church was built around the old church. The nave roof of the new church was built over the tower of the old church, which means that the present church is of a massive size. The new church would have had a tower and spire that was three times higher than the roof, but Lady Wimborne, who gave the money for this project, took the cheque back and used it to rebuild St.Luke’s, Parkstone. The organ of St.Peter’s Parkstone was exhibited by Bryceson Brothers in the Inventors’ Exhibition of 1885. It was one of the first instruments in the country to employ electric action. In 1888 it was purchased by the Revd Septimus Pontifex, a curate of St.Peter’s, who presented the instrument to the church in memory of his mother. Bryceson Brothers installed the instrument with electro-pneumatic action. The Choir, Swell and Pedal divisions were installed, but the Great was never completed. In 1915 Mr.Burton of Winchester put in an electric blower, renewed the action and provided a motor to charge the batteries. He added the large Open Diapason, a very powerful stop, which became the first and only rank on the Great. By 1930 the action had become very slow. Tenders were invited for a complete rebuild. A chorister at the time explained that a Willis organ was considered, but it was suggested that first they heard a new organ by John Compton. His instrument won them over and Compton produced a scheme for an 11-rank extension organ, utilising about half the Bryceson pipework, which was accepted. In 1982 the instrument was rebuilt and enlarged by George Osmund & Co Ltd of Taunton. The object of the rebuild was not only to increase the reliability of the organ, but also to reduce the excessive extension used by Compton and to increase the clarity and attack of the sound. The tonal scheme was drawn up jointly by Mr.R. Hill, organist of St.Peter’s, Mr.R. Fisher of Chester Cathedral and the organ builders. In the year 2000 the electrical action was replaced and an Oboe stop added by Michael Farley.